The sun erupted in an amazing solar flare today (April 16), unleashing an intense eruption of super-heated plasma that arced high above the star's surface before blasting out into space. The powerful solar flare occurred at 1:45 p.m. EDT (1745 GMT) and registered as a moderate M1.7-class on the scale of sun storms, placing it firmly in the middle of the scale used by scientists to measure flare strength. The storm is not the strongest this year from the sun, but photos and video of the solar flare captured by NASA spacecraft revealed it to be an eye-popping display of magnetic plasma. "Great eruption happening on the sun now," scientists with NASA's Solar Dynamics Observatory (SDO) wrote in a Twitter post. The solar flare erupted along the sun's eastern limb (its left side) from an active region that may also be responsible for solar storm activity observed on Sunday, SDO mission officials said. 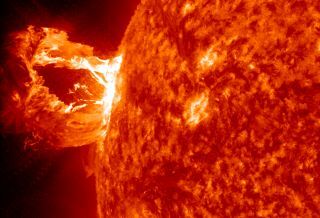 The flare kicked up a massive amount of solar plasma in an explosion known as a coronal mass ejection, or CME. "Such eruptions are often associated with solar flares, and in this case an M1 class (medium-sized) flare did occur at the same time, though it was not aimed toward Earth," officials with NASA's Goddard Space Flight Center in Greenbelt, Md., explained in an image description. The Goddard center oversees the sun-monitoring SDO mission. When aimed at Earth, strong solar flares and CMEs can supercharge the planet's auroras, also known as the northern and southern lights. Extremely powerful CMEs can pose a danger to astronauts and satellites in space, as well as power grids, navigation and communications systems on Earth. Astronomers measure solar flares on a letter scale, with the strongest events falling into three categories: C, M and X. C-class solar flares are the weakest events, with the X-class sun storms marking the most powerful events on the sun. The sun is currently in an active phase of its 11-year solar weather cycle and is expected to reach its peak activity in 2013. The current solar weather cycle is known as Solar Cycle 24.